Ultimately, the best flat feet insoles are sold by orthopedic specialty stores. The types of insoles that you would find at a drugstore may help to give you some support, but it really depends on the exact depth of your foot arches. The quality and versatility of orthopedic shoe inserts for flat feet run the gamut, from providing barely any support to being amongst those given the highest marks by consumers. Before you purchase a new pair of shoes for flat feet, give the inserts covered below a try. The name Dr Foot might not be familiar with you, but this manufacturer of orthotics for flat feet makes some of the most comfortable and supportive inserts in the business. Each pair of shoe inserts is measured to be custom molded to your feet. This ensures that the arch portion of your shoe will be exactly the right height, making running and walking more much comfortable. The WalkFit brand of flat feet insoles is also quite popular. Giving customers the option of customizing their insoles to their specifications, you are guaranteed to get the perfect fit. 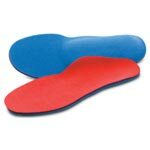 These insoles are superb for flat feet running as well as general work purposes. People of all ages with flat feet can have WalkFit flat feet insoles made to spec. Spenco Total Support insoles also provide extra support in the arch area, giving users a more natural stride and better overall posture. Whether you spend all day sitting behind a desk or like to stay active, this brand of flat feet insoles will leave your feet feeling totally refreshed at the end of the day. Appropriate for all day use, you won’t have to worry about keeping an extra change of shoes in the car anymore. Having flat feet may make you feel like you have to miss out on fun physical activities, but these supportive insoles can help help keep your feet intact. Select a brand that is within your price range, but be sure to test out new inserts whenever you get the chance. Never again do you need to wear specially made orthopedic shoes when you have all of these high quality insoles to choose from.